I'm now working on my second scene ideas. 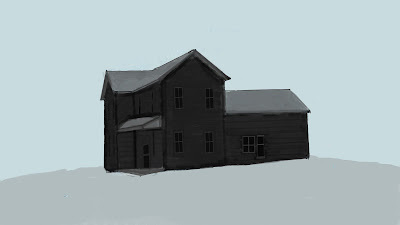 I've been looking at some images of Ed Gein's house, which I posted a few days ago. I'm now working on my digital concept to get a final scene before I start Maya. I picked up a few films today to influence my scene as I'm going for a rural-American dysfunctional type house, with clues to there being a muder or abduction surrounding it. I've decided to set the scene in snowy-weather (Matches the season! )plus this will give me the oppourtunity to make the house seem much more 'abandoned' and overgrown. I've just bought The Hills Have Eyes (1977) and also the remake (2006) along with the remake of The Texas Chainsaw Massacre (2003). I'll watch these through and take some screenshots when I see some scenes that I think reflect my Idea. Below Is what I have so far of my concept (Very little) I'm going to add detail as I go along. 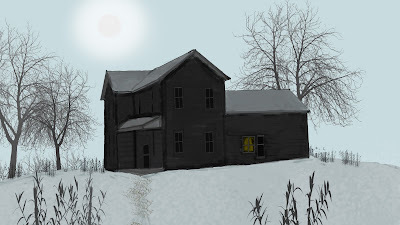 It is meant to be set in a sort of dim-wintery time of day (Like it has been for the last month here in Kent) The house will be surrounded by branches and trees, as well as bushes on the ground. There will be abandoned farm-machinery half-covered in Snow. I want to give the scene a subjective view, I'm going to try and accomplish this by creating clutter around the camera (Branches and such) making it seema s though the viewer shouldn't be there and is watching from secrecy. Bit of an update, still need to add a lot more details and depth to the scene, including all the strange rural-type machinery and abandonment. Go Sam! Loving the commitment to moving your idea forward - very encouraging! Go onto MyUCA and check out the class files that would have been for today – Its Merry Christmas fun with Fur!!! Watch the videos and see what you can come up with. I’ll give you a full explanation in the New Year. Nice work too Sam...keep going!